Bolster your annual giving strategies and skills with Canada’s premier program for annual giving professionals in education. Book your accommodations now at the Delta Hotels Toronto Airport & Conference Centre. Deadline: September 15. Prepare to share your advancement innovations at #ccae2018 from June 5 - 7 in Halifax. Review the guidelines on preparing your proposal, the selection procedure for presentations, and other important details. Free to CCAE members, CCAeLearning webinars share actionable lessons from the latest advancement successes, all in one hour. Join us at 1 p.m. Eastern on Thursday, September 28 for Successfully updating your ‘traditional’ event, presented by John Grant, Director, Alumni Relations, Simon Fraser University. Register and invite all your advancement colleagues to participate. Greet the new academic year prepared to build your advancement skills, knowledge and networks with CCAE professional learning opportunities. CCAE's National Partner, TD Insurance, has worked closely with CCAE since the Canadian Council for the Advancement of Education came into existence 24 years ago. For 19 of those years, starting in 1998 in response to the critical shortage of trained advancement professionals in Canada, CCAE and TD Insurance joined together to create a remarkable internship program, the TD Insurance Fellowships in Advancement. A member of the TD Bank Group, TD Insurance is the largest group insurance provider in Canada. In addition to being the undisputed national leader in affinity marketing, TD Insurance has been providing exceptional service to its clients for over 65 years. Drawing on the expertise of a dedicated service-oriented team, TD Insurance is now the largest direct-response group home and automobile insurance provider in Canada and one of the top personal home and automobile insurance groups in the country. 4,000 professionals at the service of 2.1 million customers. A portfolio of over 2 million policies representing $3 billion in premiums. 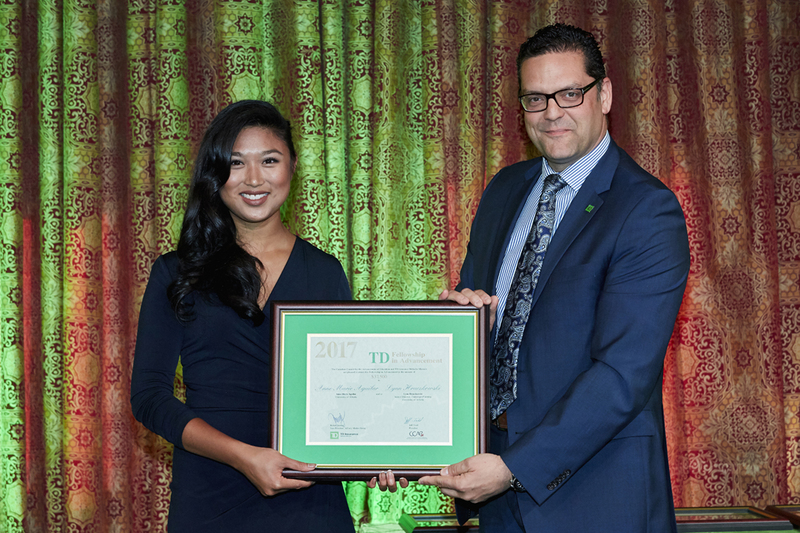 Anne-Marie Aguilar, University of Alberta, receives her 2017 - 18 TD Insurance Fellowship in Advancement Award from Max Stiles of TD Insurance.